As I am going on a short holiday, this blog will not be updated on the 21st of November, but instead be updated on Wednesday the 22nd of November, and then again on Monday the 27th of November. Due to my exams, this blog will not be updated until Friday the 17th. And its back. I’m hoping to update it every Tuesday, Thursday and Sunday night. And for now, I’m getting stuff from back to the 4th of November. They say no news is good news, so lets hope it is for most of the Australian Rowing 'World'. There is a lot of media stuff from the past few days, so I havent really written what its about- I didnt have time, but next time I promise I will. Its the first post for a while, but I do have some news. I'm planing to update the layout and everything of this website in the next school holidays, so you only have to deal with this for a couple more months. Also if their is anyone who ever has any news to contribute, or who would like to help me do this, then email me- aussie_rowing_news@hotmail.com Thanks. Hello faithful Aussie Rowing News readers. Its been a long time and I'm sorry, but our internet was gone for a whole month (I know, the tragedy), and its been school holidays so I couldn't do this at school. I'm not going to be able to get all the information from the past month- I'm not even going to try, but I will start over fresh tomorrow. Thanks for everyone's comments, which I got today, and check back again tomorrow. Mens' squad: Samuel Bailey, Tommy Bertrand, Thomas Nickson, Tim Wright, Thomas Swann, Alexander Machin, James Adams, Chip Delany, Christpher Lefebvre (cox), James Ferrie (res.) and coached by Simon Harrison. Womens' squad: Rachel Thomas, Heidi Wilson, Grace Hicks, Courtney Adamson, Michelle Yann, Lauren Battaglia, Carley McKay, Alysha Batliwalla, Kate Fitzgibbon (cox), Cecilia Riley (res.) and coached by Brenton Terrell. World Championships News articles- Aussie rowers working towards Olympics, More medals for Australian rowers, Australia finishes with minor medals, Aussie rowers settle with minor medals, Unknowns join gold rush, Women's pair spring a surprise, Australia unearths Oarsome Foursomes, Aussies celebrate World Rowing success, Aussies win three gold, Aussie rowers can add seven more golds, Gold rush for Aussie rowers, Rowers set to break 20-year drought. Good to see so many articles- their where even colour photos in both melbourne papers today!! !Now if only Australia was as excited about this as they where about the soccer world cup! Dominic Monypenny wins the arms only male single easily. So thats Australia's 4th gold!!! 9:30 Julia Veness-Collins, Ben Vines, Gene Barrett, Kristin Mercer and Susie Edwards come 4th in the A Final of the LTAM4+ placing them 4th in the world!!! 12:15 the M8+ of James Chapman, James Marburg, Matthew Ryan, Sam Conrad, Tom Laurich, Karsten Forsterling, Cameron McKenzie McHarg, Jeremy Stevenson and Marty Rabjohns come 4th in the A Final! Well done to all the crews who rowed there... and also well done to "f" who left a comment predicting that Australia would get 7. Email me for your prize! 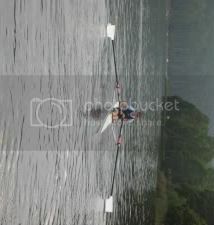 7:00- The B final of the W2- Emily Martin and Sarah Heard come 3rd, which places them 11th overall!!! Dominic Monypenny won the AM1x Heat in 5:36.67, so he is into the A Final!!! Rowing Australia- "Australian crews scintillating in the opening days of the 2006 World Rowing Championships", and like above "Rowing coach position vacancy: Sydney University Boat Club" all on www.rowingaustralia.com.au, also the World Championships Daily Report. Some newspaper articles- Ginn coasts into semi-finals (The Australian) and Aussie rowers struggle at world titles (The Age)- but today they have done everything but struggle! In the first event of the Championships- the W41 heat Australia defeat USA, Ned(?) and Canda to qualify for Final A, with the fastest time of the two heats. 9:06pm- The Australian W2x come 2nd in their final, qualifying for semi final A. 9:18- The Australian M2x come 5th, missing out on 4th place by .1 of a second, but only 1st qualified for the a final- so it will be a repecharge for them in the next day or so. Found out some more results from the World Universitys Championships- the LM1x came 1st in the B Final, the LW4- came 2nd in the B Final, W4- came 3rd in the B Final and M4- came 4th in the B Final. I thought there where more crews than that, but its all the results I can find. An article about Bebe Clarke, from the Junior World Championships here- we actully had a comment from his mum somewhere down the page congratulating us on this site. Lots of NSW news- The final 2006-2007 regatta calander, A call for entrys in the Mosman Marathon, and A call for entrys in the Newcastle Uni Sweep Oar Championships . Also the Results and point telly from the JB Sharp Series (All PDF files). And finally, the World University Championship Championship results, Elsa O'Hanlon was the only Australian to get into the finals, and she won the LW1x. Unfortunatly, the results are quite hard to find, and I can only find out the results of the finals, so I am not sure how all the other Australian Athletes went. The Aus light chicks guest book isnt working so if you want to wish them good luck, email auslightychicks(at)fastmail.fm, or check out their website for updates. Its also the world uni championships, but im finding it really hard to find out info,so i will keep looking, but I probably wont know anything until tomorow. James Worrell of rowing photos says that the 2005 World Championships are now up on his website, and the 2006 World Championships images should be up by early September.Photos soon to be put up will also include other world cup and world underage events, and the Australian National Championships. Rowing NSW has a Level 1 Coaching Course and the 2006 - 2007 Regatta Calender. On Rowing WA, the State Selection Policy and the club pennant_points. Australia go into the race on an outside lane, they would obviously not be the favorite, but have done very well. Australia go through the 500 in 6th place- but only about 5 seconds behind 1st place, with Germany, Great Britain and Italy in medal positions. A bit of a clash between Great Britain and Belarus slows down the crews, and Australia does a push and tries to catch up. At the 1000 they are 7 seconds behind 1st place, but only 1 second behind NZ. At the 1500 they are in 4th place,and pushing down hard, catching up on bronze place- only 3 seconds behind. Im not even there but it sounds quite exciting over the internet. Germany win (7:08.83), Silver to Italy (7:11.23), Bronze to Great Britain (7:16.76), and Australia get 4th place in (7:18.14). Our NZ neighbours come 5th (7:21.38), and Belarus brings up the rear in 7:23.20. Well done girls!!! Australia go into this as one of the two middle lanes, and pass the first 500 only .5 of a second later then Germany, who's in the other middle lane. Along with France hot on their tail, Australia try to keep up with Germany, but by the 1500 Germany are about 5 seconds in front, and France has dropped away, leaving Croatia, who have come from 6th place, in 3rd place. Then as they reach the finsh, Germany win, followed by Croatia, and Australia get the Bronze medal! Well done to all the Australian Crews- 1 Gold and 1 Bronze, and a fourth is a job well done! Its also well done to Germany, with crews getting a medal in 11 out of the 13 events. Australia has all 3 crews in the Junior World Champ A Finals. There is live video on the World Rowing Site, and I'll put up the results as they come. The Australian Crews are racing at (w4-)10:00pm, (M2-) 10:58 (M4x)11:58. I'll put up the results for the W4- tonight, but the rest are past my bed time- but if someone would like to post a comment to inform everyone, or else check out the world rowing site (see link above), and i'll put them up tomorrow morning. I also cant find the link on the web, but I was reading an article in the Herald Sun yesterday about how Mike McKay and James Tompkins are thinking about making a come back for the 2008 Beijing Olympics- and how they, along with Drew Ginn and Duncan Free could make the Aussie Eight into the "Dream Team"
And back to the junior world championships- Australia held the world record for the fastest time at the junior world championships for about about 5 minutes yesterday, until it was broken by a crew in the following race. Then, this afternoon, the Aussie W4- came 2nd in the repecharge, so are into the A Final. Tonight the Junior World Rowing Champs started- the womens coxless four were the first crew from Australia to complete. They came 2nd, needing to come 1st to qualify for the A Final, and they will need to race the repecharge tomorrow. Then the Australian Coxless pair come through and win their heat, qualifing for the A/B Semifinal with the 2nd fastest time. The final Australian crew to race in the heats was the male coxless quad. They came 2nd, which puts them straight into the semifinal. Wednesday the 2nd of August to Saturday the 5th of August is the Junior World Championships- held in Amsterdam. The Team staff are: Noel Donaldson,Vicky Spencer, John Bowes, Ian Beltz and Urs Graf. I row for a really good, but small club in Australia, and am annoyed with how little publicity the best sport in the world gets in Australia. So I've decided to start my own little Australian version of The Rowing Service News, and hopefully one day I'll almost be to busy with rowing and rowing news to do this everyday!